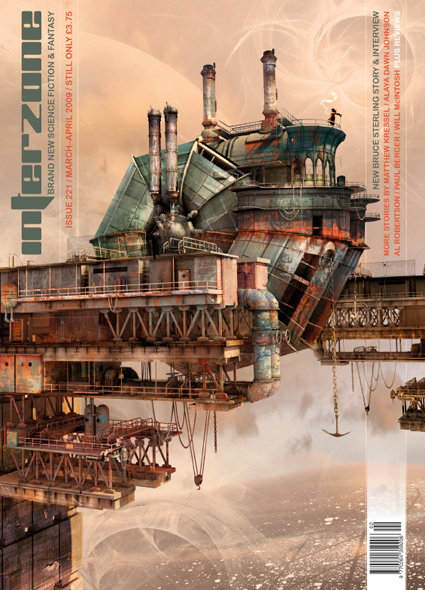 Interzone issue 221 is published on 12th March. There’s more to great stories than entertainment and aesthetics: they foster greater understanding of ourselves and the world we inhabit, and they challenge the way we think. I discovered anarchism at the same time I dipped my toes in the turbid waters of sf&f. I encountered Christie and Meltzer’s The Floodgates of Anarchy while I was reading Spinrad’s novel of media manipulation Bug Jack Barron, Sladek’s satire of corporate servitude ‘Masterson and the Clerks’ and Moorcock’s ironic and anti-authoritarian Jerry Cornelius books. It was an epiphany. The fiction clarified the anarchists’ assault on the deadening repression of our society. And the anarchist polemic reinforced an enjoyment of sf&f – a literature that took me beyond the life I led, the places I inhabited and the assumptions that limited my own possibilities. I hope others are making a similarly serendipitous, frightening and enjoyable voyage of discovery – wherever it takes them – but believe it’s less likely to happen today. This isn’t nostalgia for a ‘golden age’ of radical sf&f, but an appalled realisation that artistic dissent has been absorbed and commodified by the cultural mainstream: genuinely mutinous work is increasingly rare. The clamour of sanitised and bogus outlaws – pre-packaged by the music business – and the hypocritical campaigns of tax-minimising, self-indulgent rock icons drown out the voices of original and passionate musicians. The soi-disant ‘Young British Artists’ claim they explore the morality of art and money, but grab top dollar for their lucrative mock provocations. Their anaemic repetitions of the Dadaist experiments of 1916 aren’t merely banal and senseless in a contemporary context – they make it harder for genuinely challenging work to find an audience. It’s the same in film, TV, theatre and literature: the cultural landscape has never looked shallower or more derivative. But if, as Jung asserted, the psyche creates reality every day, the genuinely resonant and original stories we receive at Interzone constitute a shield against this barrage of mass media crap. Independent publishing must survive the current crisis: any hope our culture can escape its corrupting obsessions with money and celebrity lies in writers like ours, and readers like ours. Last edited by Andy on Tue May 12, 2009 2:27 pm, edited 1 time in total. Wow. I'm fast becoming a fan of Adam Tredowski's art. And I've always been a fan of Kropotkin. Another GREAT cover and very interesting editorial. Yeah, what he said! And not only are the YBA's weak echoes of Duchamps et al - they aren't nearly as clever or funny. Marcel knew he'd made his point when he gave it all up in favour of playing chess. See, this is why I like Interzone. There's maybe one story per issue that I really like. If I find one story in an issue that enhances my life, then that's real bonus. But the ratio is so low because if you're genuinelly trying to challenge and reach out to people, then you're going to miss with an individual far more than you're going to hit. It'd be easy to have something bland which comforts my--and most other reader's--prejudices and leaves us feeling satisfied with 90% of all the stories published. That's just spinning the wheels, though. We owe it to ourselves to keep pushing and challenging otherwise we're never going to get anywhere new. And what's the point of sf&f if you're not getting somewhere new? And that's a seriously amazing cover. I saw it and a little sigh escaped. Jim: Kropotkin's Mutual Aid suddenly looks as relevant as it ever did. Or maybe it's just me 'doing a Mark Twain' (ie Twain became increasingly bitter and radical with age). Thanks for the feedback galaxie500 - very much appreciated. Mike - Duchamp's Fountain was one of the post ww1 Dadaist provocations I had in mind. I can't see many of the YBA's giving it all up for chess. BTW: Alan Moore had something very interesting to say about the corrosive impact of money on conceptual art in the latest Disinformation podcast (http://disinfo.libsyn.com/rss). Foxie: I'm glad you like IZ for the reasons you set out, It is, of course, great to hear from readers who are happy for us to take risks and find stories that disturb, unsettle and provoke, but I wish more of the stories had a direct appeal to you. Keep letting us know! I too was knocked out by the cover - Andy C. has impeccable taste. Another fantastic cover. I'm really looking forward to this one (Will McIntosh and Bruce Sterling in particular). I'd love to get computer wallpapers (in 4:3 alas, for me) for these new covers Something to consider? Another great cover and an intriguing line-up. IZ just gets better. Regarding the paint-by-numbers editorial: "It’s the same in film, TV, theatre and literature: the cultural landscape has never looked shallower or more derivative". Most generations have self proclaimed wanderers of the cutting edge making such declarations (e.g. Michael Moorcock's editorials in New Worlds). That's not to say the cultural landscape of each generation isn't dominated by the shallow and derivative, but succeeding generations (i) point to the parts of culture of a previous era that wasn't s&d and say "Oh what a time, we shall never see its like again!" and (ii) get all nostalgic about the popular culture of the era they (or that era's avant garde of the time) despised at the time. For example, I was around at the time of punk; it was great, an important era of free expression etc etc and, indeed, etc... but musically that era was dominated by disco, which was reviled at the time by most po-faced serious music fans (e.g. me); but now, there's nostalgia for it: the quality stuff (e.g. Chic, Sugarhill records) is admired and put in its socio-economic context, the crap enjoyed as what it really was - fun. Stephen, I wasn't claiming any special status in writing this piece, it was simply a personal view (which hasn't been changed by your suggestion of ‘fogeyism’). I think the contemporary cultural landscape is tough for talented artists, particularly if their ideas are out of step with the political mainstream. I don't think I was whining so much as simply celebrating the some of the great stories people are sending in to Interzone. In my view we've had a very good run recently. There is some great stuff out there (Red Riding part two tonight - bring it on!) but there's also a lot of played out old tosh being lauded for its originality and passion. BTW: I don't accept the notion that editors, readers, listeners, and viewers aren't entitled to respond to work. I can't think of many genuinely talented writers who are happy to receive only peer reviews). Your editorial got me thinking about the gap between high-profile sf&f (like Heroes and whatever piece of crap Will Smith is in), and the stuff being published in places like Interzone. The world of small press sf&f has its own set of established tropes and ideas which are taken for granted by those who are part of the world, but which are years away from the general public. And yeah, most of the high-profile stuff is derivative. But then I started wondering where the source was, and realised that it was very, very old. It seems to me that there are these stories and ideas which humanity finds fascinating and evocative, and each generation needs to find its own way of exploring them. So maybe things are as derivative as I thought, its just a different generation exploring an old idea in their own way. Perhaps the same is true in more general terms. I mean, all teenagers feel a need to rebel against their parents, so maybe every generation feels a need to rebel against authority in the language of their time. It does seem to make a little bit more sense to me to see the YBAs not as radicals, but as Kevin the sulky teenager. You'll always get stuff out on the periphery of any age that is a bit sharp and sparkly. When they're of a past time, they don't seem nearly as threatening and so can be 'discovered' by another audience. Hell, my music collection is full of psychedelia, early 70's rock and folk, and I can't stand the sort of stuff white kids from the suburbs blast out their riced cars. You know, the sort of kids who brought early 70's rock and psychedelia and blasted it out their bedrooms. So anyway, that was my two cents.